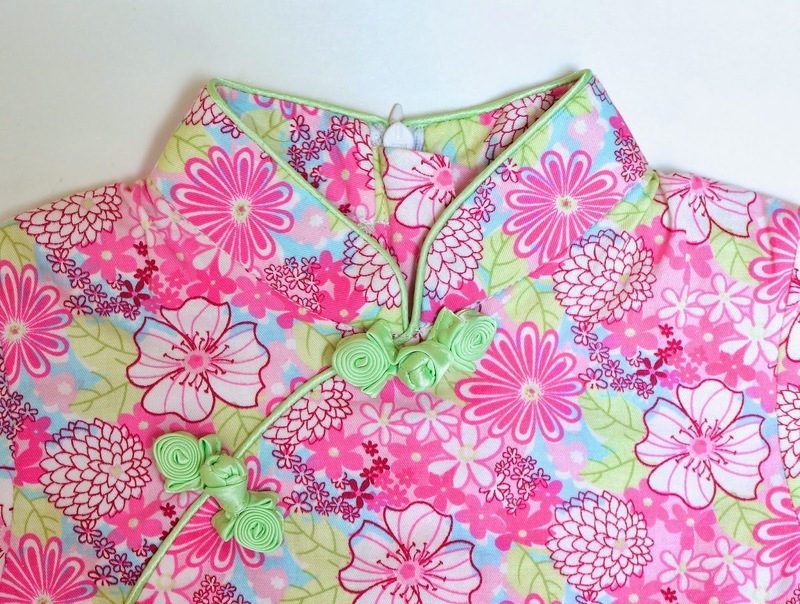 Today's frog button tutorial tutorial is brought to you by my mother Mae! Which is how long it took me to finally post it! 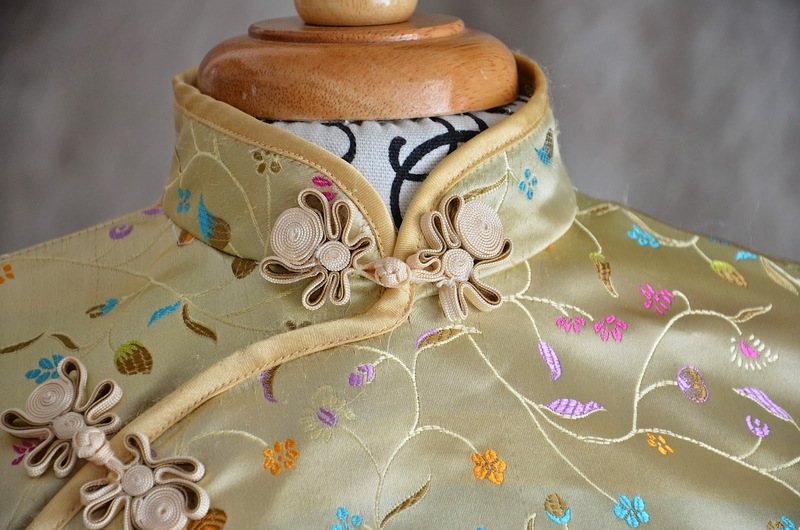 So, here's the story: I first made frog buttons many years ago when I was a teacher and we needed a sample blouse for the seamstress hired to sew competition costumes for our high school choir. I sewed this blouse and made the buttons to match, after which we found someone who was able to custom-mass-produce them, based on the sample design. 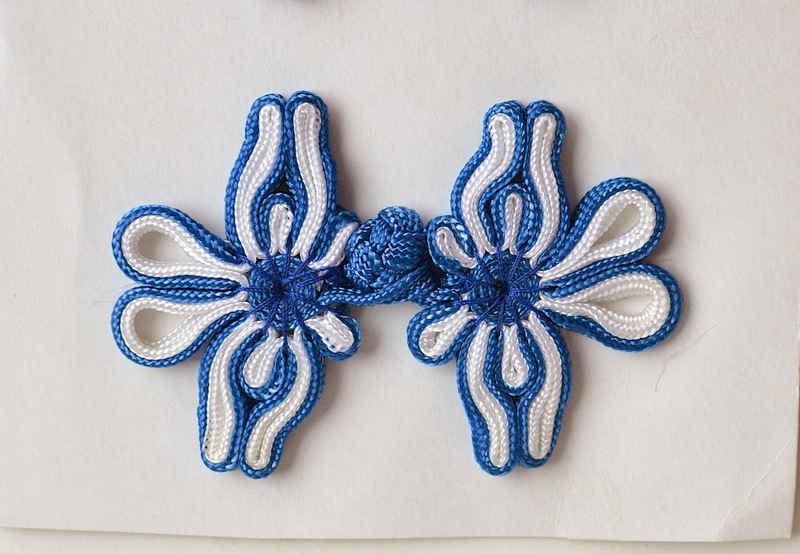 I was lucky that Mum could make the ball knot because being a traditional garment element, it wasn't something people in my generation had as part of their sewing repertoire (if they sewed at all, I mean). 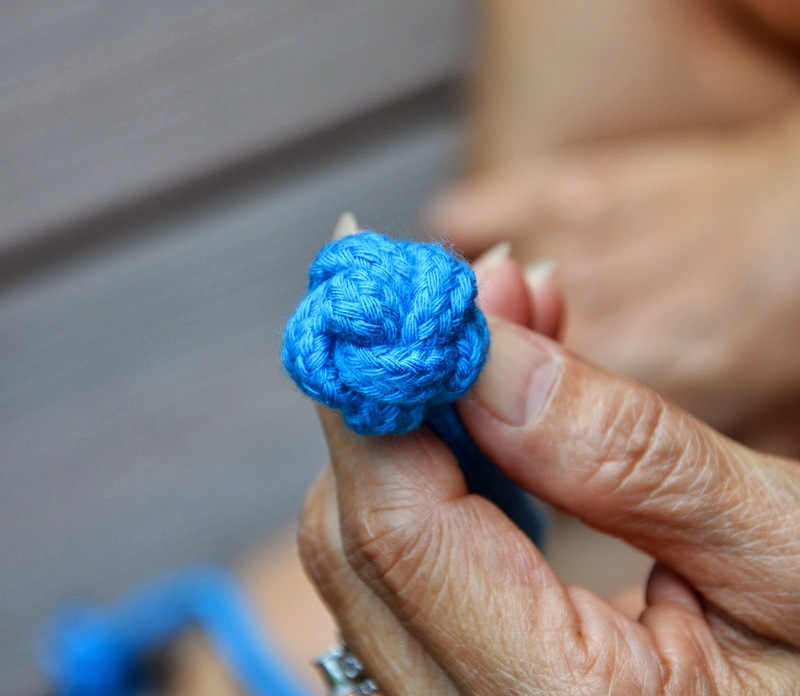 Centuries passed, during which I completely forgot how to make the ball knot so when my parents were visiting us here in the US three years ago, I had Mum refresh my memory. 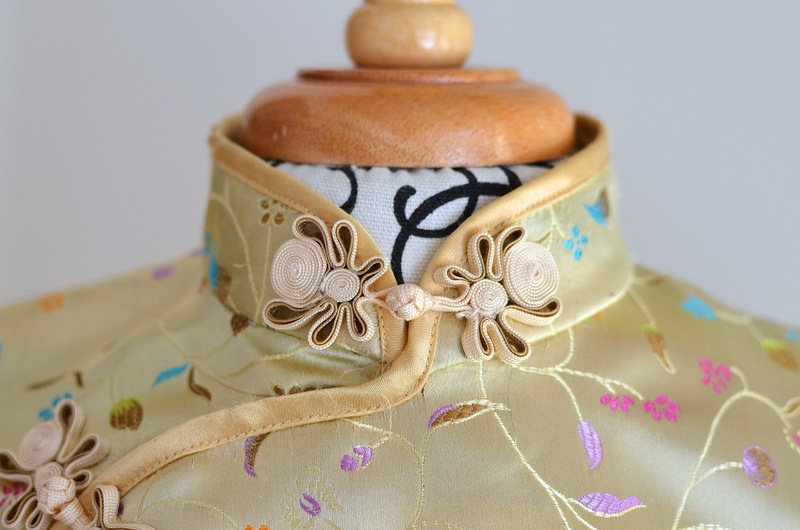 I took a series of still photos of its various stages, bought some brocade in anticipation of making a blouse to showcase the buttons, and then got distracted by other projects and babies growing up and preschool chauffeur duties. Late last year, I unearthed those photos and decided that if I didn't do something about them now, I never would. I think it's very exciting to have my parents teach you stuff because they are amazing people who know the strangest and most wonderful dying-art variety of techniques. I wish they lived closer (or at least in the same country) because I'd be filming them a lot more often to preserve all the things they know. I want to do this more but it's challenging because when we do meet, we'd rather just hang out and enjoy each other's company than collect tutorial fodder. 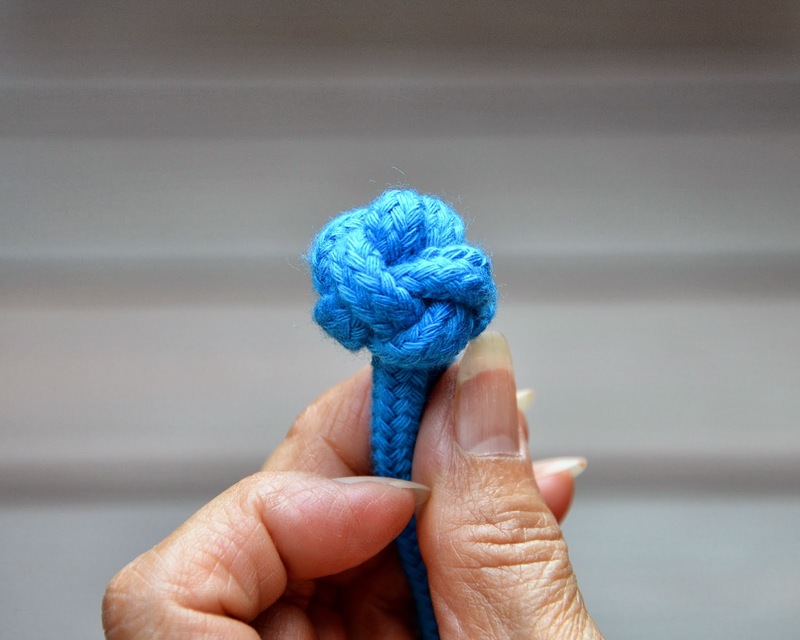 Anyway, you get to share what I do have so far- that one tutorial by Dad on marbling paper, and today's, in which you'll see Mum's hands in action, making the Chinese Button Knot. Some preamble before we actual begin the tutorial. 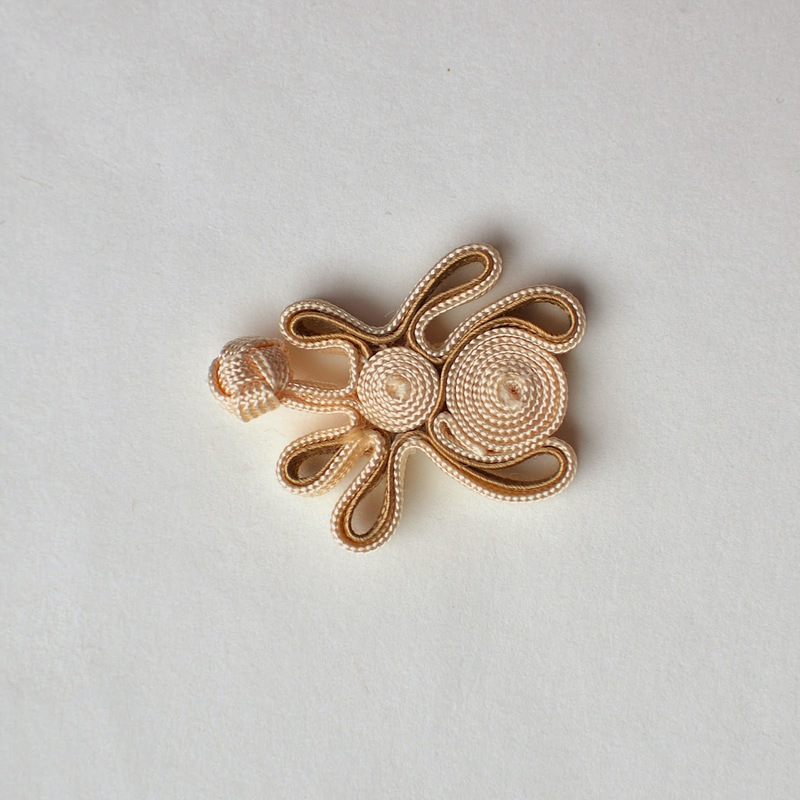 the decorative part that you stitch onto your garment, and which is loopy and beautiful and looks like a frog. and they make a pair/set of frog buttons/closures. 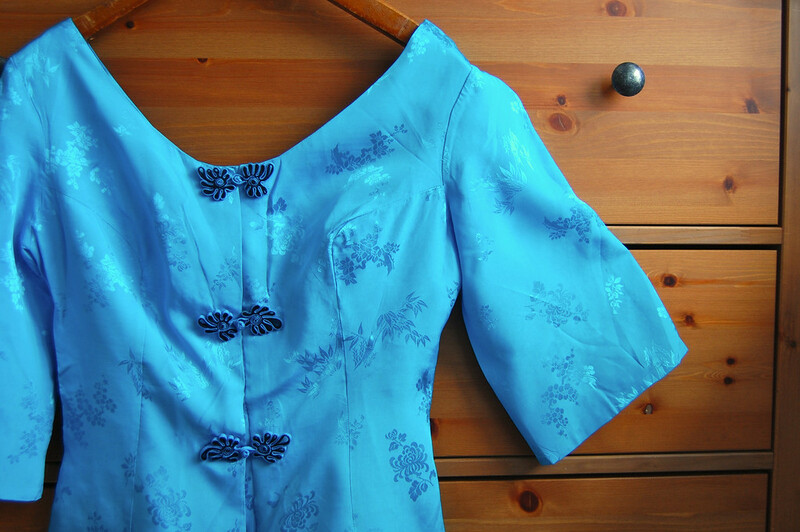 And then you make a couple more pairs/sets and you'll have enough to fasten a typical qipao (or qipao-style blouse). 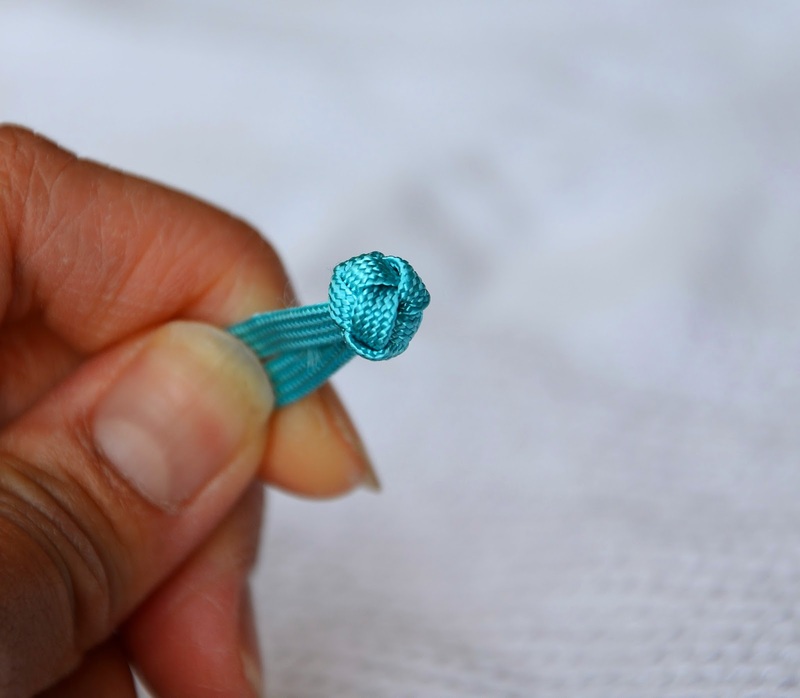 The most important part of the frog clasp/frog toggle/frog button is the knot. As I mentioned in this earlier post, the frog portion is purely decorative and, in the case of masculine garments, even completely absent. 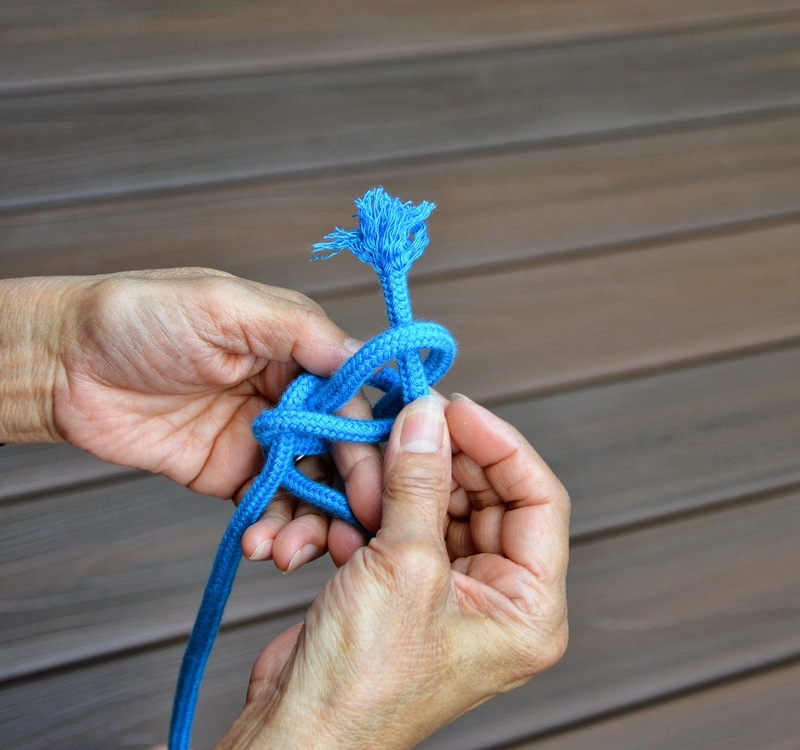 The knot-and-loop, though, is what makes the closure work at all, so we're going to spend an obscene amount of time and effort to do that today. 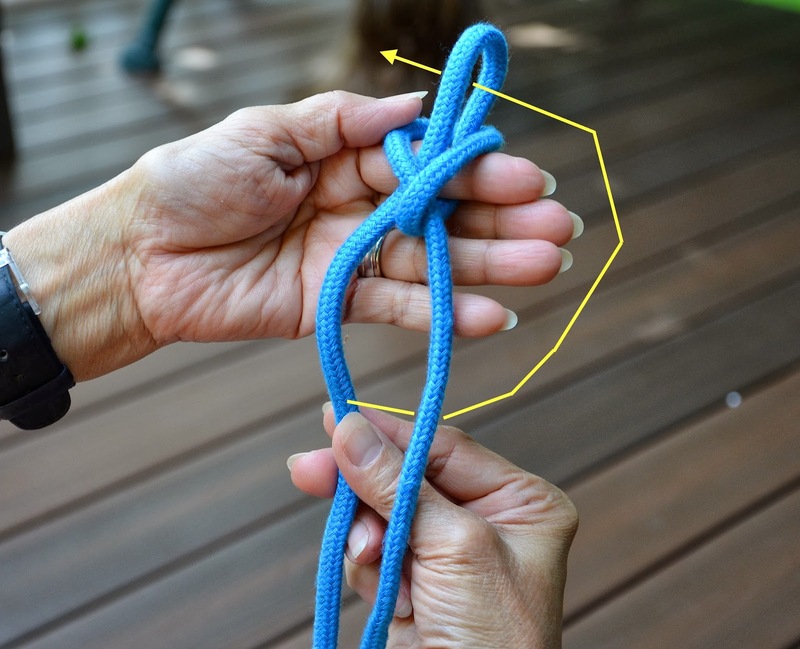 In the following photos and video, we're using a thick cord for visibility, but real frog knots are obviously made with much thinner trim or bias tape. and loop it over your thumb. and lay it over the first loop. Prepare to pull that underlying bit of cord up. 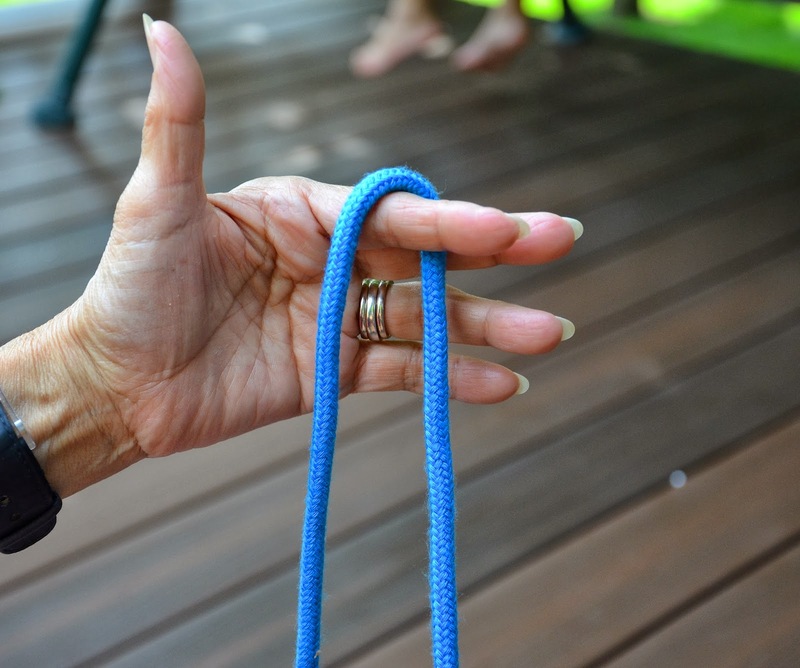 Pull that underlying cord up into a short loop. 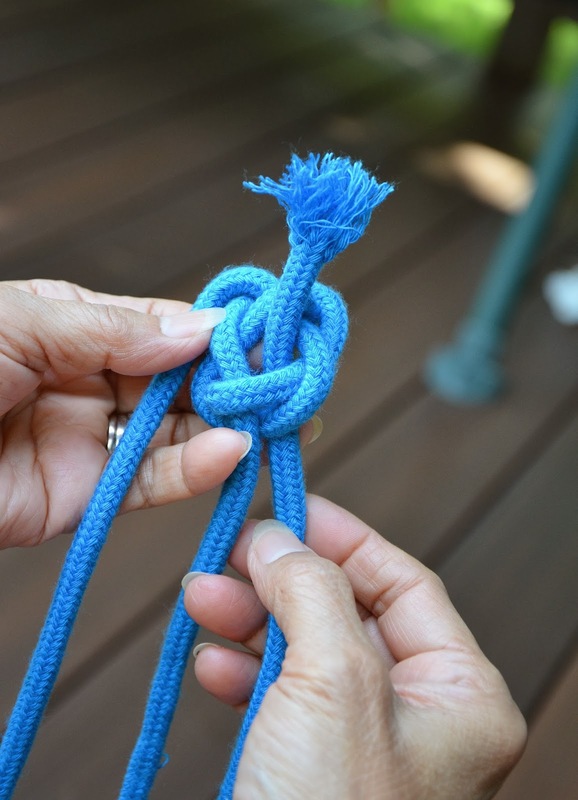 Adjust and tighten to form this knot. 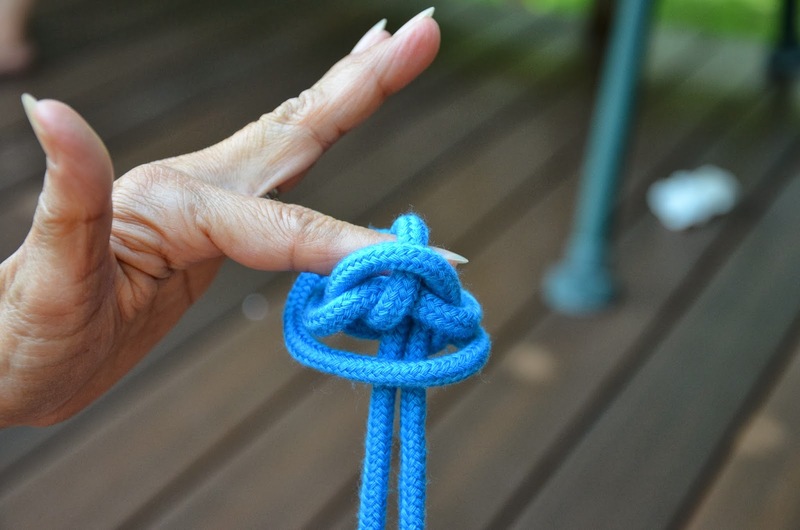 Note that the knot is still perched on your finger like a ring. Do not slide it off your finger. 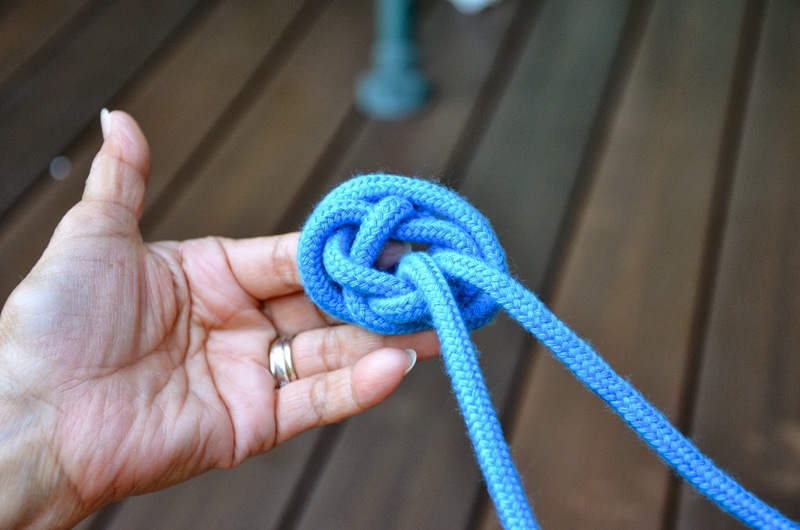 It needs to remain there throughout the entire knot-tying procedure. 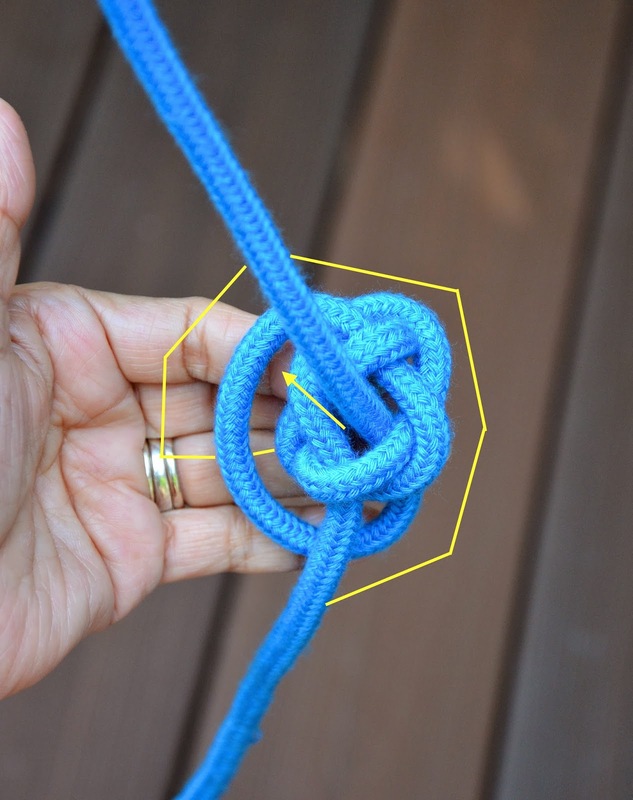 Also, see that hole in the middle of the knot? 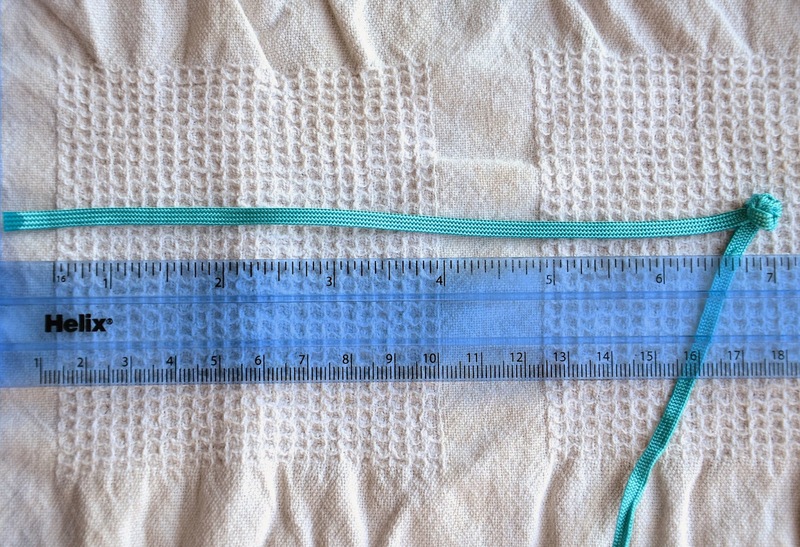 We're going to be inserting the two trailing ends of the cord through that hole. like so. Pull the cord all the way up through the hole. 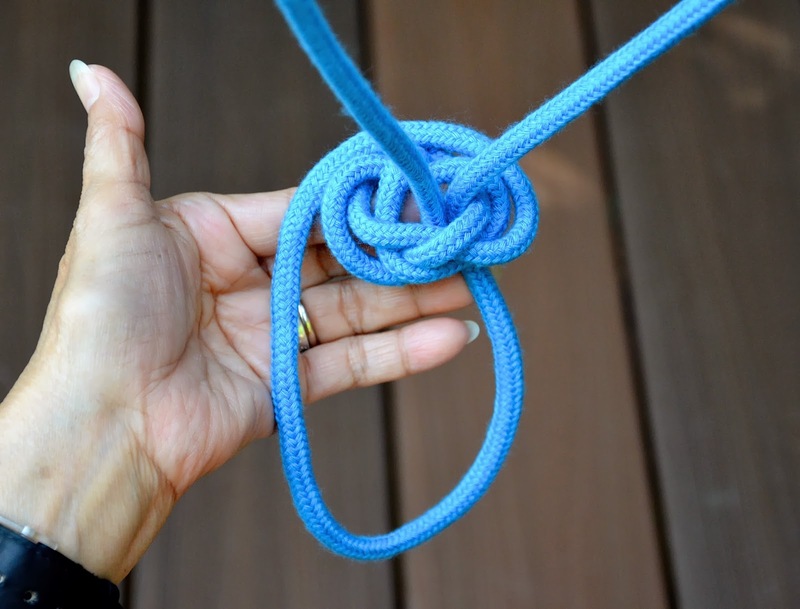 with the whole knotty mess still perched on your finger. 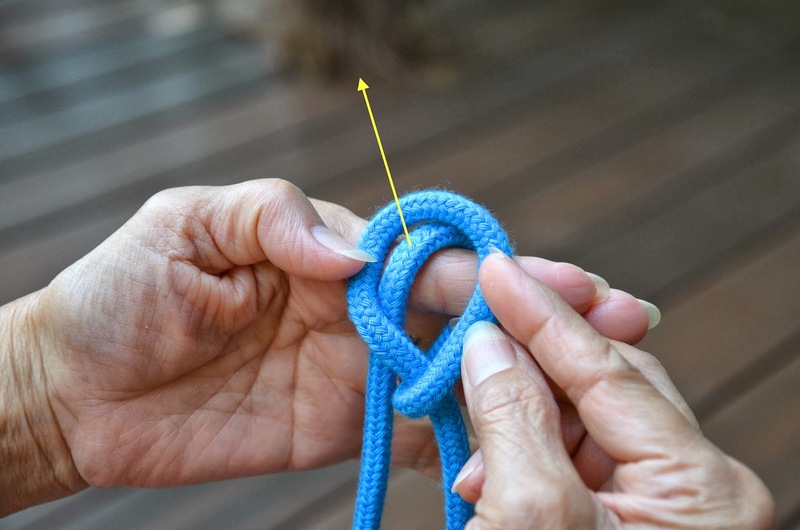 Slide everything off your finger, and begin tightening the loops (it's okay to tighten even that loop that was wrapped around your finger, and it is okay if it "disappears"). 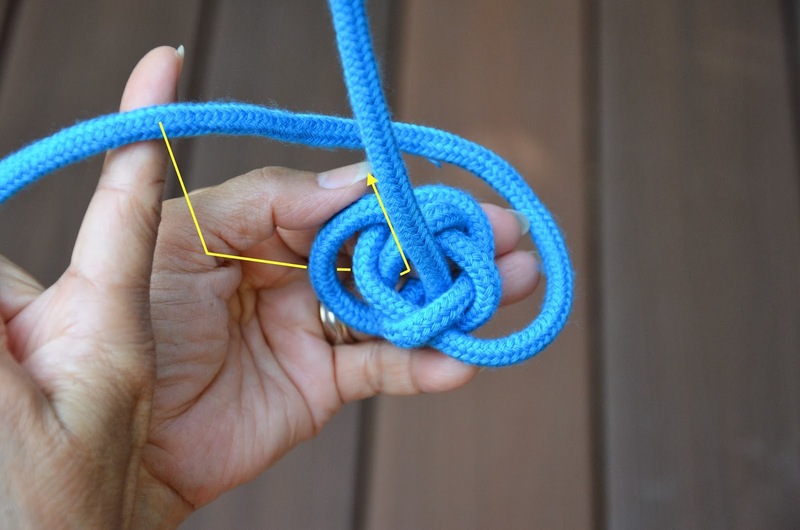 If you flatten the knot out, it should look like this - even and symmetrical. Further tightening will result in a snug little ball. 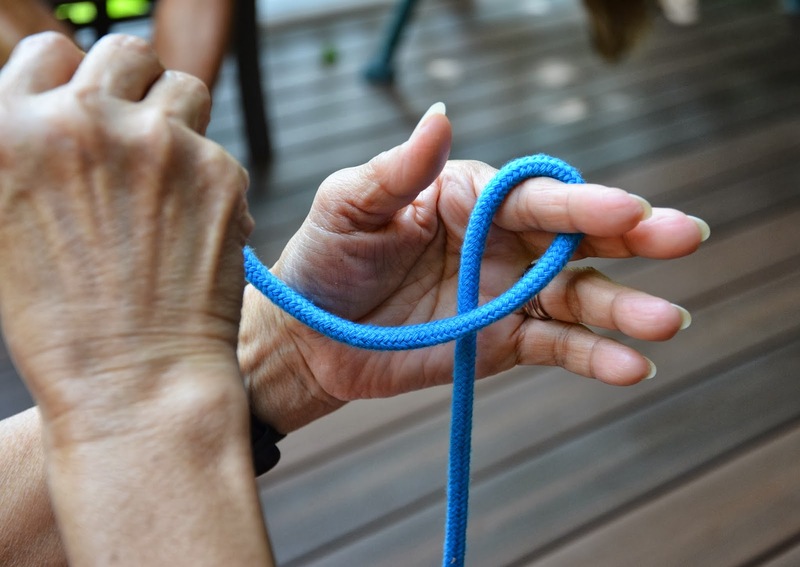 Here is a video I made to show you that whole sequence in action, including my unsystematic fumbling in the second half as I tighten the knot. I refused to edit it out so that you'd know that it's perfectly okay to dig around and pull and poke and take forever to get a nice, tight sphere. Just click on the image below to go to the video on Youtube. 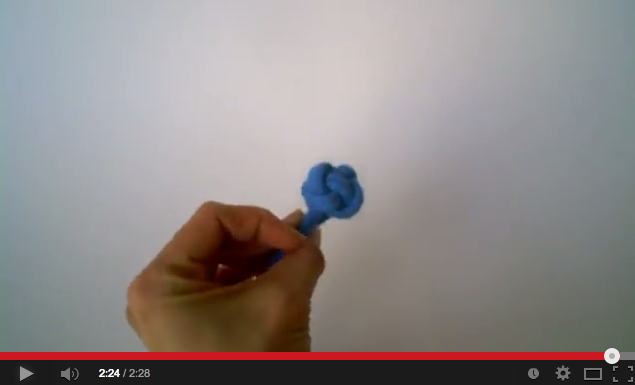 Those are my hands in the video, by the way, not Mum's. If they'd been Mum's, there wouldn't have been fumbling. 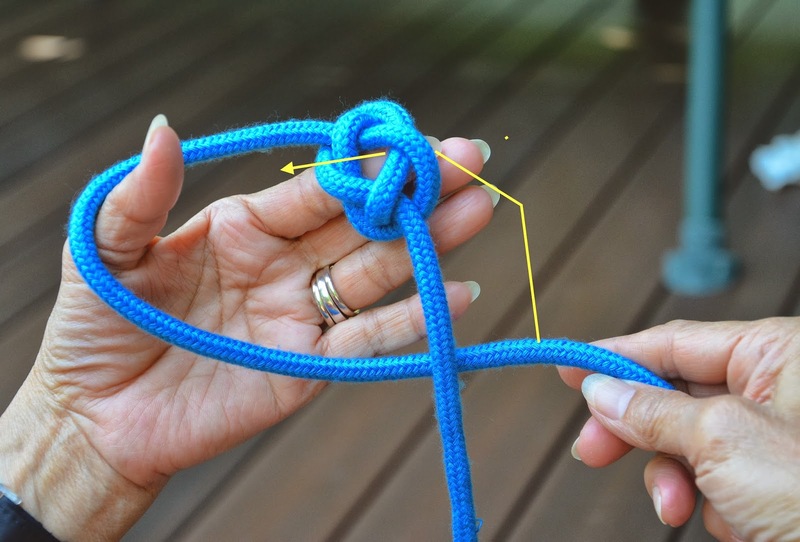 Having learned to make the ball knot, we can now go wild and design the elaborate, swirly, loopy frog portion of the closure that gives it its name. Let's first talk about materials. 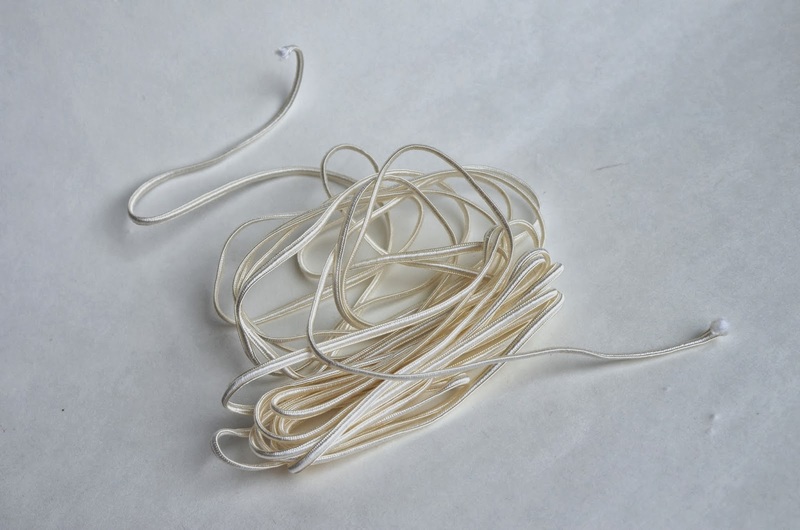 Generally, you can make frog closures from any kind of narrow tape, trim or cord. 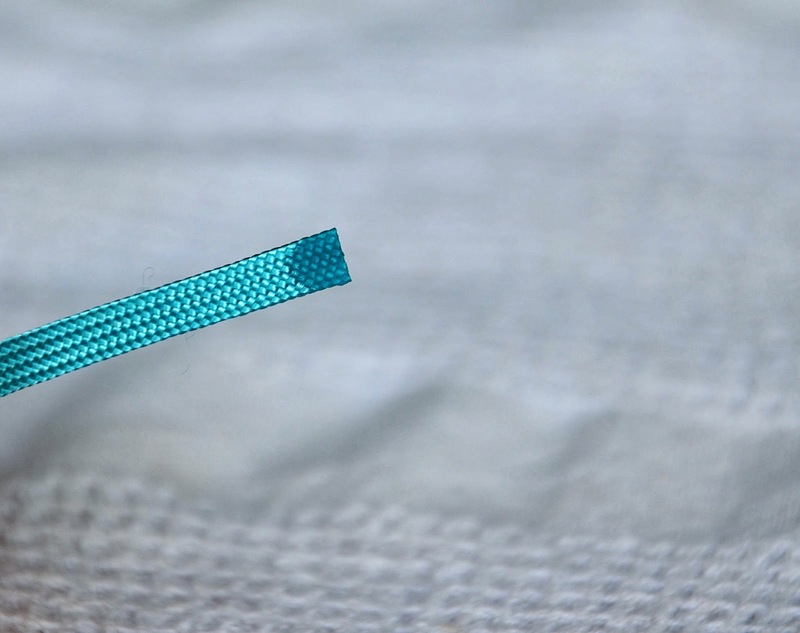 The flatter the strip, the easier it is to coil tightly. 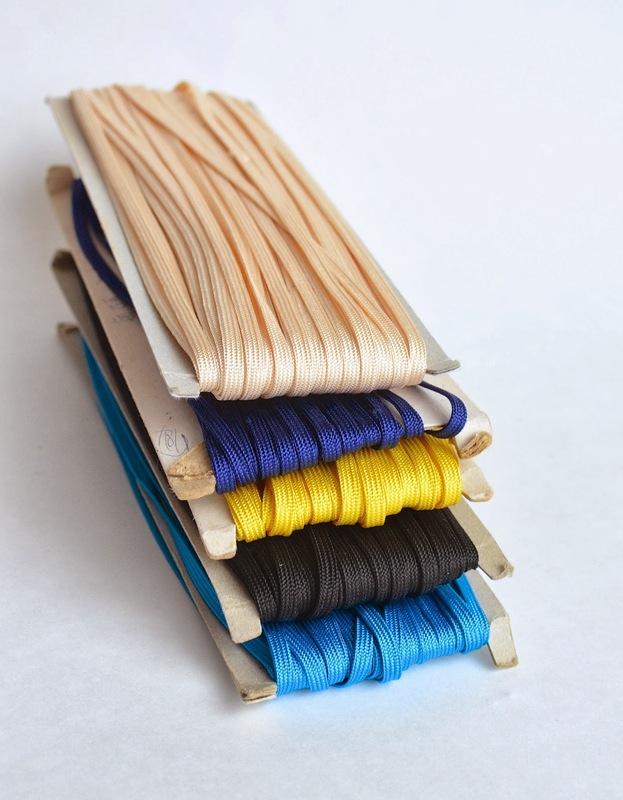 Different tape/trim/cord will also produce different textures and looks. 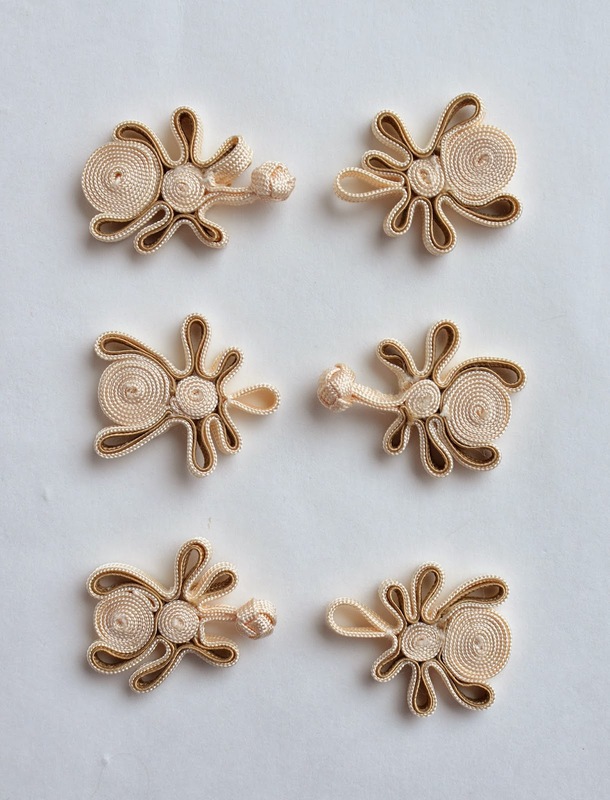 Long ago, people made their own fabric 'cord' for these buttons. 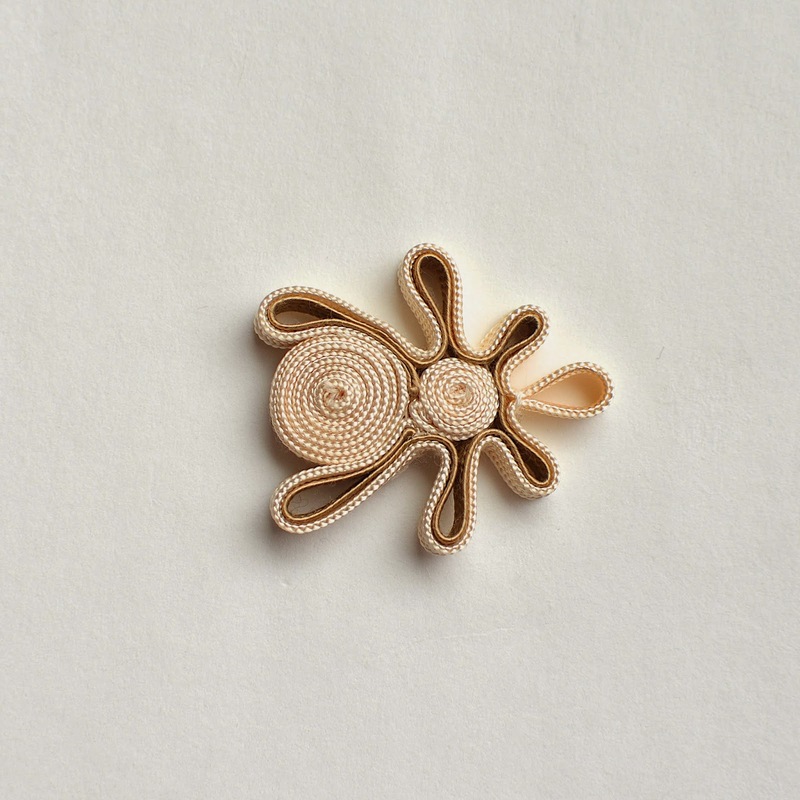 They meticulously hand-stitched strips of fabric into flat tubes, and then knotted and wound them into the balls and frogs themselves. 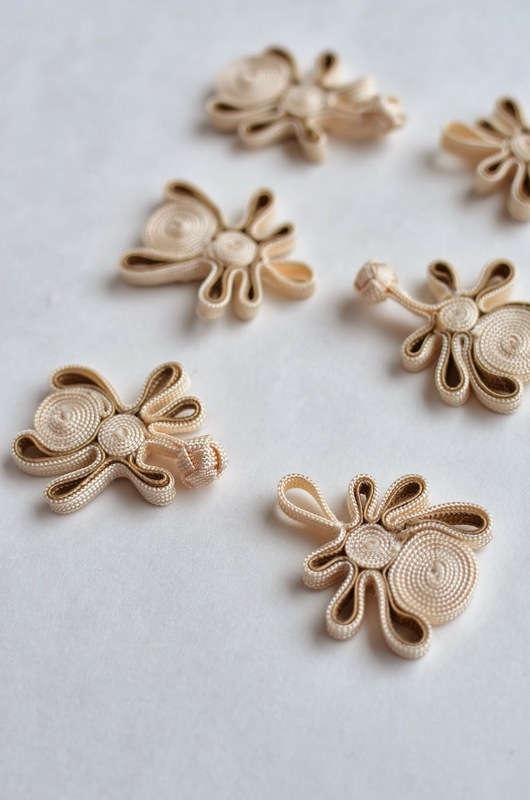 Nowadays, with access to all kinds of ready-made trims and cords, we can afford to be a little less "from scratch" and just enjoy the button-making process itself. 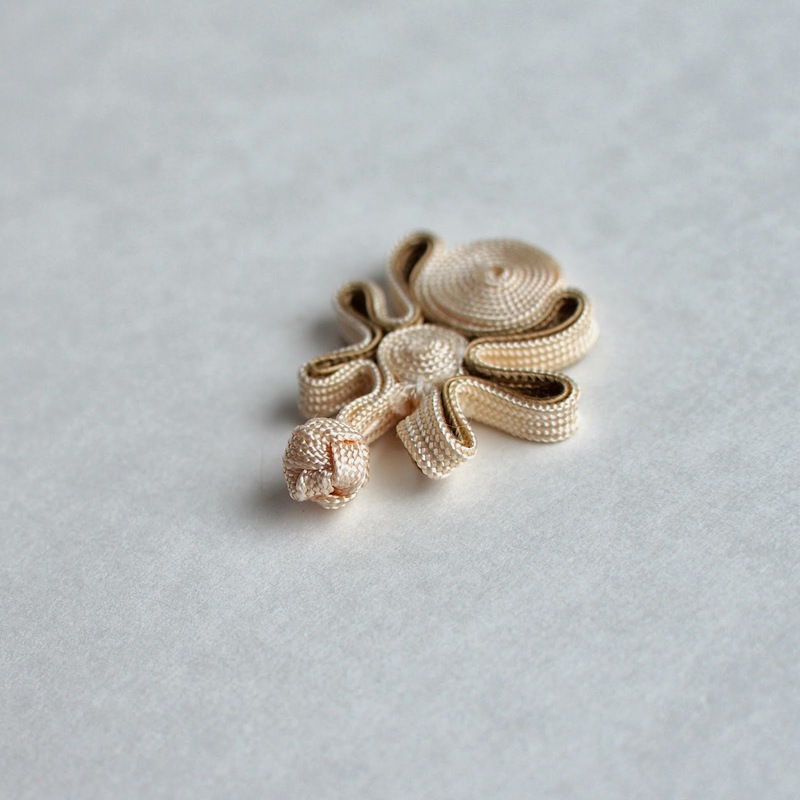 Very traditional frog buttons were sometimes made stiffer with thin copper wire inserts. 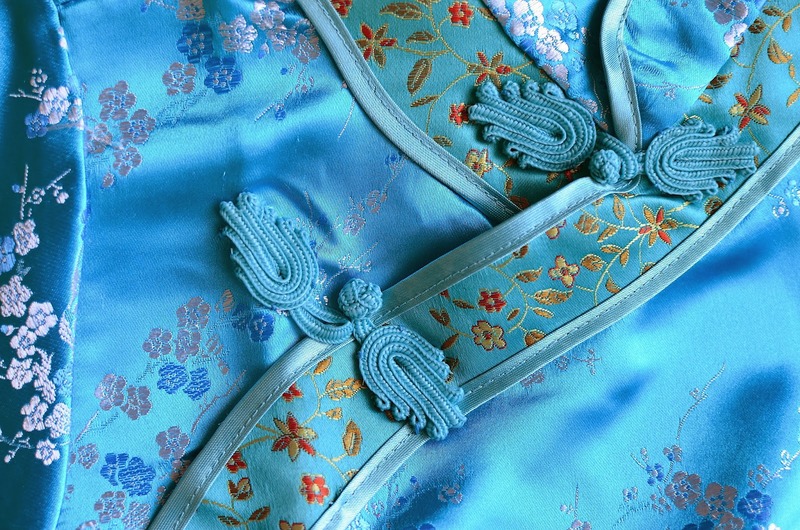 This was often the case with soft satin frogs on brocade garments - the cord was hand-made from skinny capillary tubes of satin, threaded through with fine copper wire and then the frog loops and design formed. The copper wire helped hold the shape of the frog, but you had to be very careful when laundering the garment in question. In the old days, everything was gently and lovingly hand-washed on a corrugated washboard over a basin of water, so this was not a problem. Naturally, I, being a paragon of traditional practices, tossed mine in the electric washer, the unhappy result of which was all the copper wire bits poking out from the bottom of the buttons and me, aghast, muttering, "Where the hell did all this metal come from? It looks like an electromagnet moulting!" 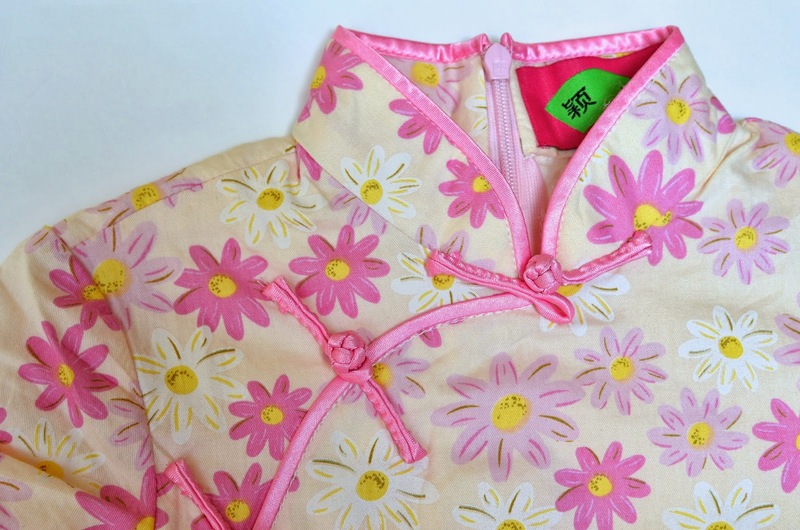 I am very rarely profane, but this was one of those times of great duress when, in the face of irreversible trauma to one of my favorite garments, I weakened and behaved uncharacteristically heathen. Needless to mention, the poor blouse was never quite the same. As we were saying before the nightmare flashback, any strip of fabric can be used to make frogs. 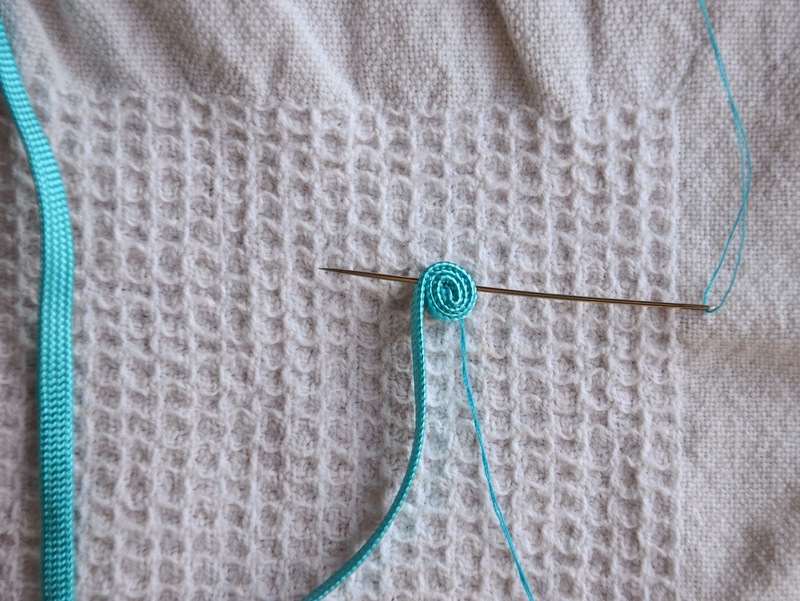 Bias tape is an easy option, but be prepared to stitch the fold shut so it behaves like a single-layered strip. 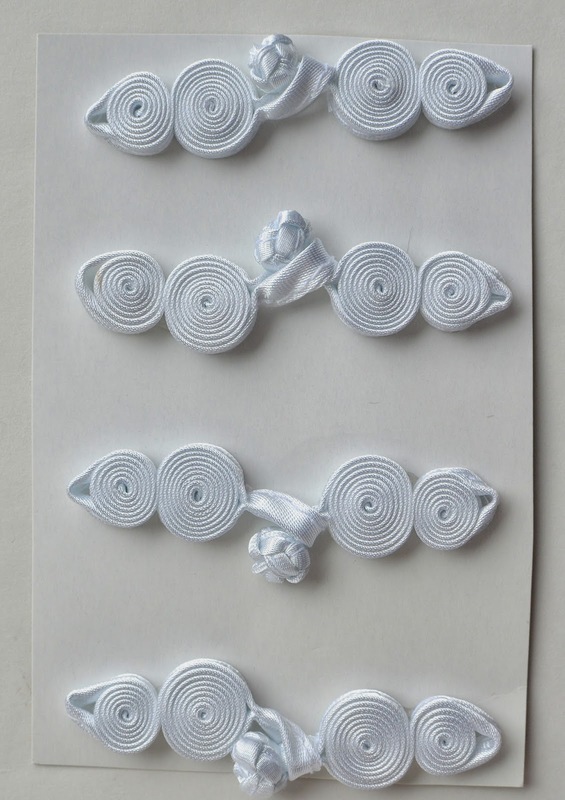 I like using these straight trims - they are like satin ric-rac, but straight. We buy them in Singapore on cards like these. 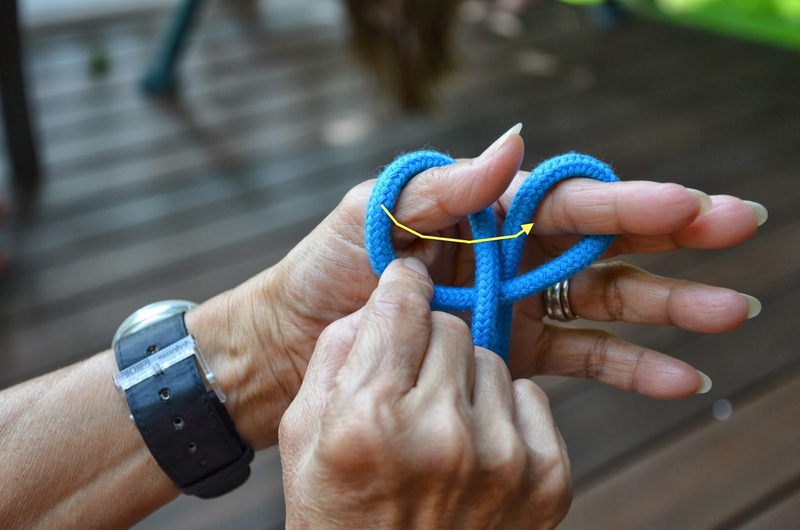 Incidentally, that flat fancy knot just behind the loop and ball in the photo above is the same ball knot flattened out. See? 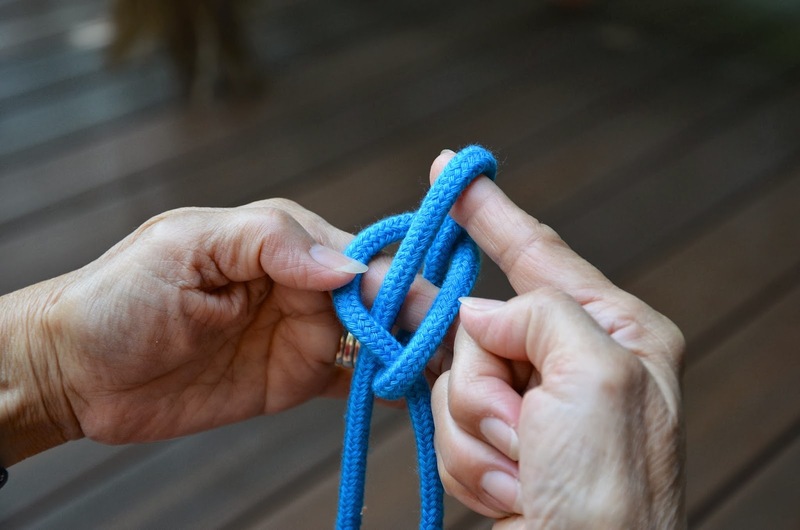 Next, let's talk about variations, beginning with the very simplest- just a straight band with either a knot or a loop at the end, without any "frog". This kind of closure is common in men's garments. Now, let's actually make some frogs. 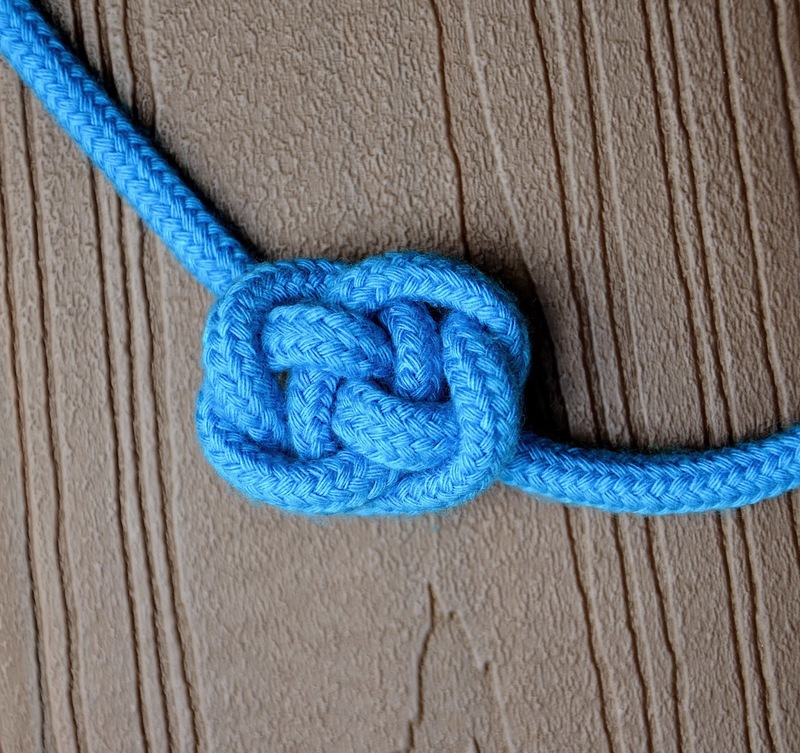 We begin with the knot (we'll tackle the loop counterpart later). 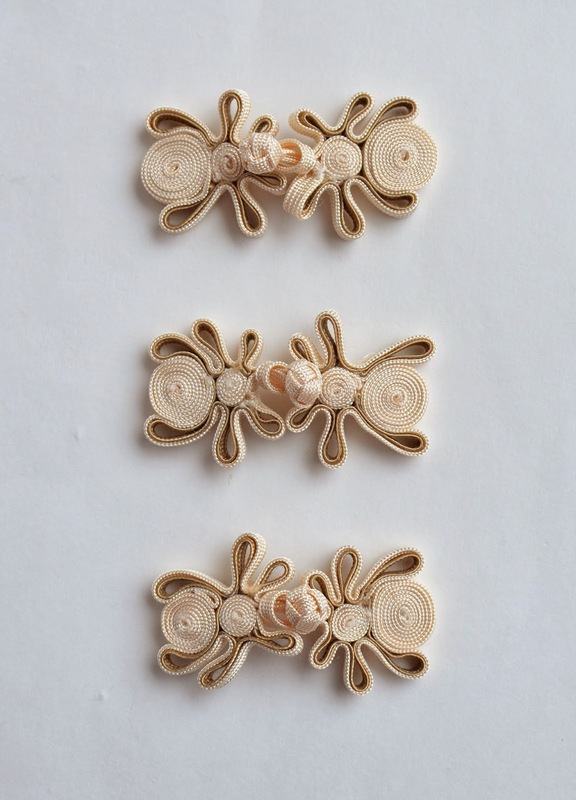 Make the knot, leaving about 6" trailing ends of trim with which to make the frog portion. 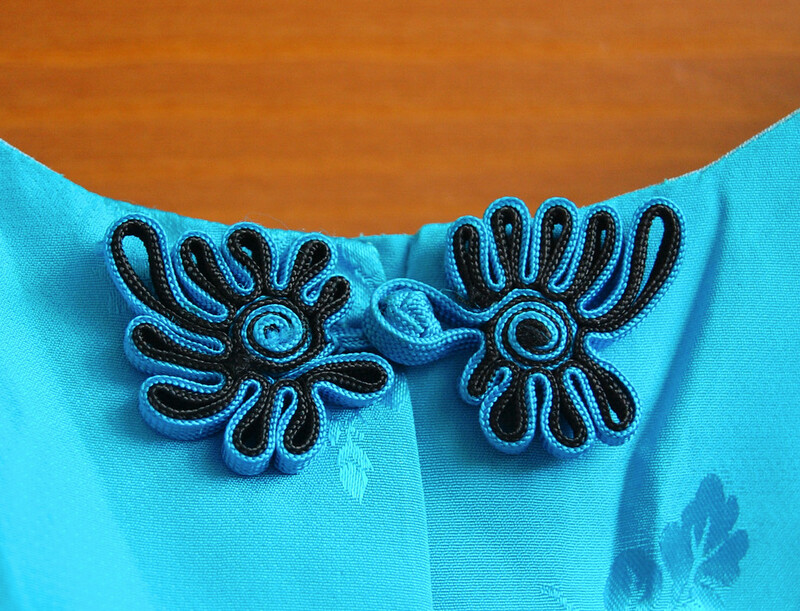 It is a good idea to seal the ends (I used Fray-check) if your material unravels easily. 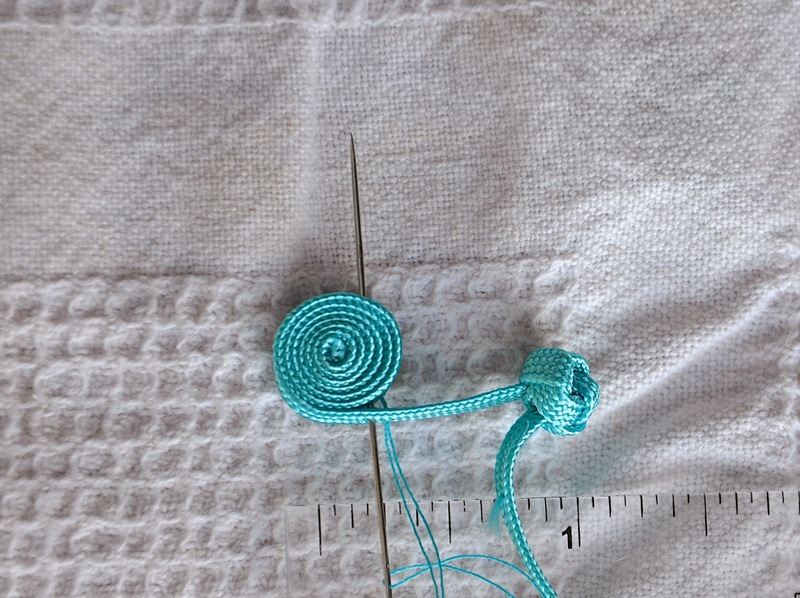 and coiling inwards towards the knot (or loop), stitching through the entire coil to secure it as you work. Here is a finished example of frogs made with coils of satin tape. 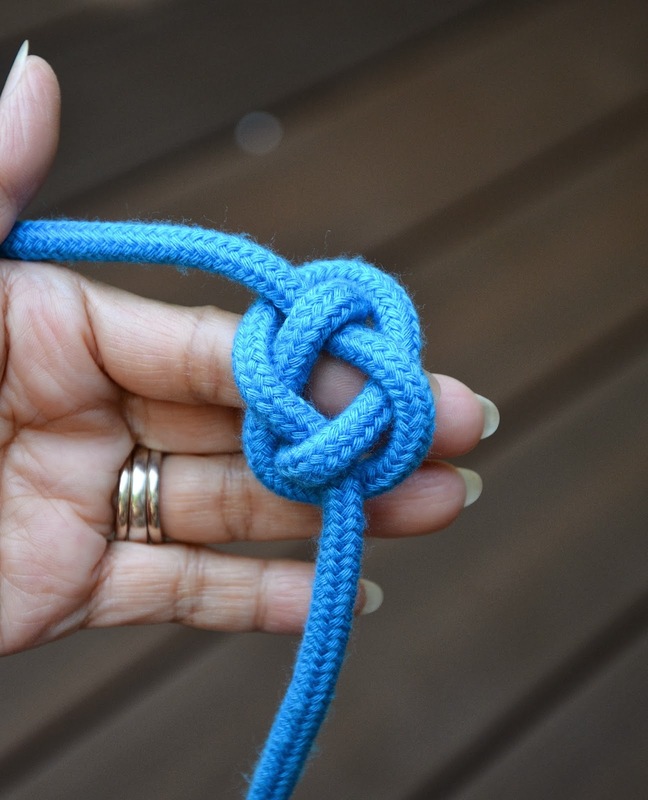 Here is another coil design, plus a fancy flat knot that I showed you earlier. 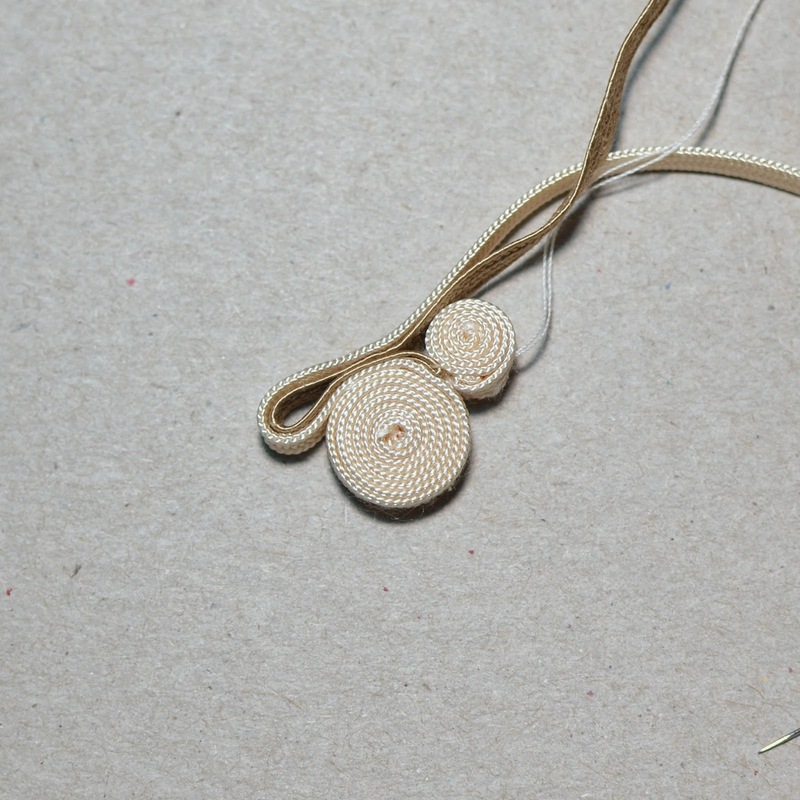 When making the knot button, I start with the knot, and then loop and coil around it to create the frog. 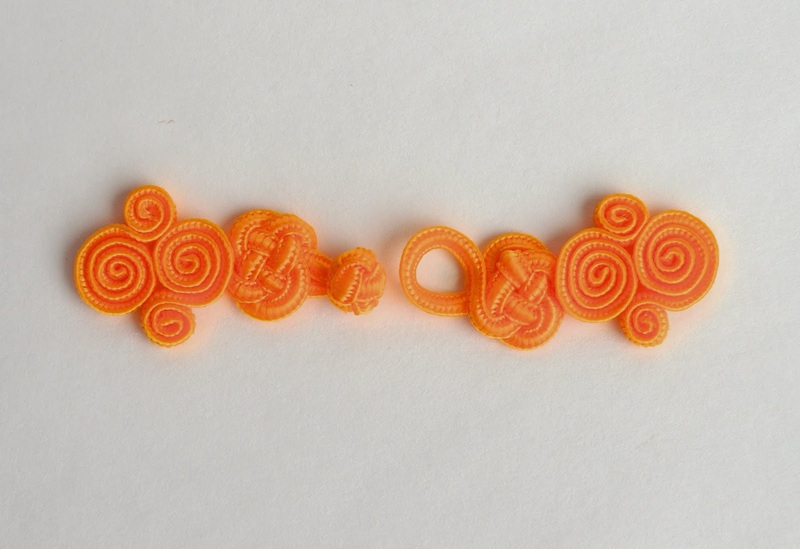 When making the loop counterpart, I start with the coils and swirls of the frog, and then make the (centrally-located) loop halfway through the process. Here are some photos of that sequence. I began with a small coil, separate and complete. That was set aside until needed later. 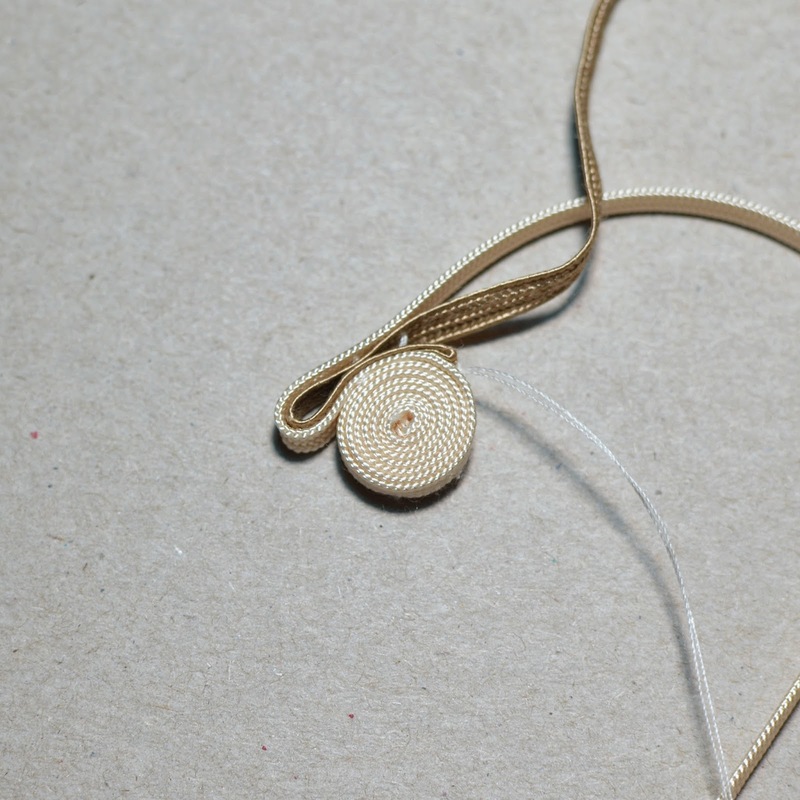 Then I made a larger coil and, with the trailing end of the trim, began to form loops, adding the second, darker strand of trim as an inner layer. 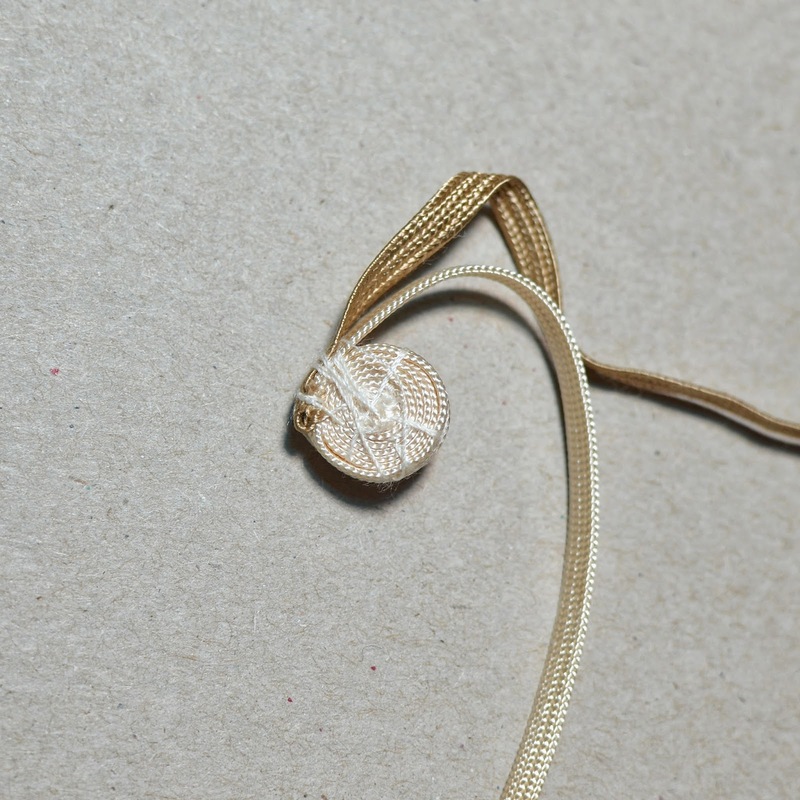 The smaller coil from above was then introduced and more loops formed around it, including the actual Loop that will receive the Knot from its button-partner. 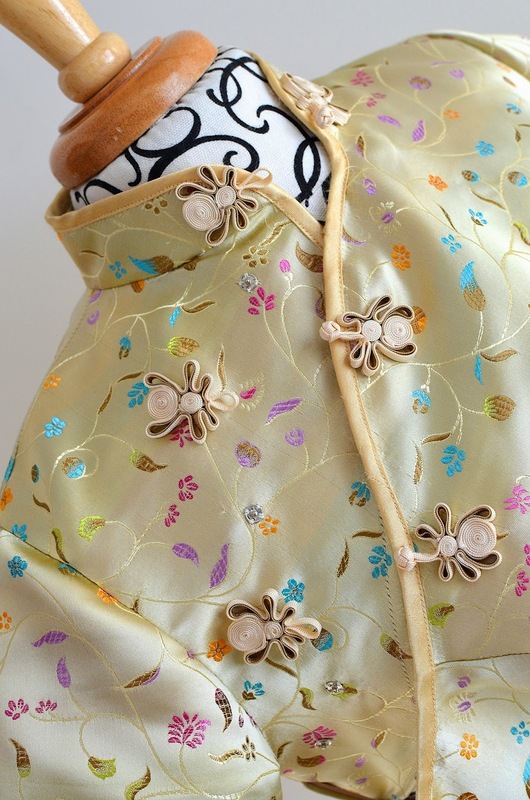 Stitch through the layers of trim to hold everything in place, sewing over the back side, but keeping the front clear of stitching thread. 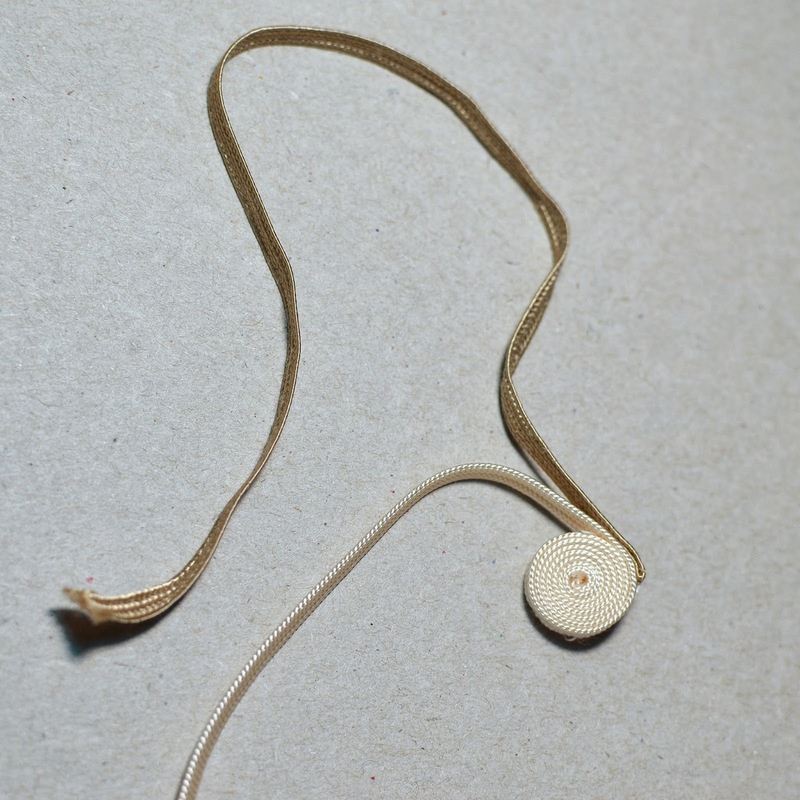 A rosebud variation: a single coil with a pair of flanking loops for leaves. 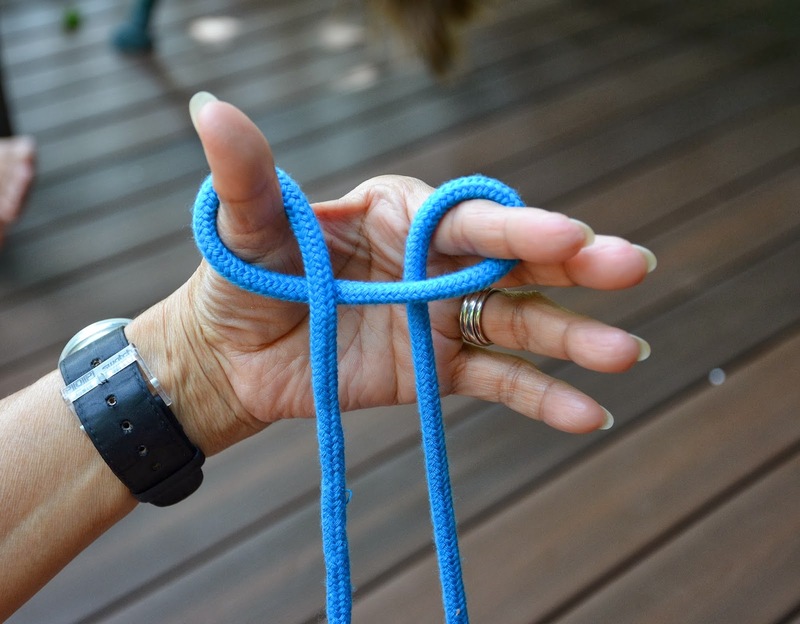 Quite a different variation: arcs of cord. Let's end by discussing how to attach the frog buttons to a garment. Frog buttons are bona fide fasteners, but they are best placed where they are visible (because they're also highly decorative) and easy to manipulate. 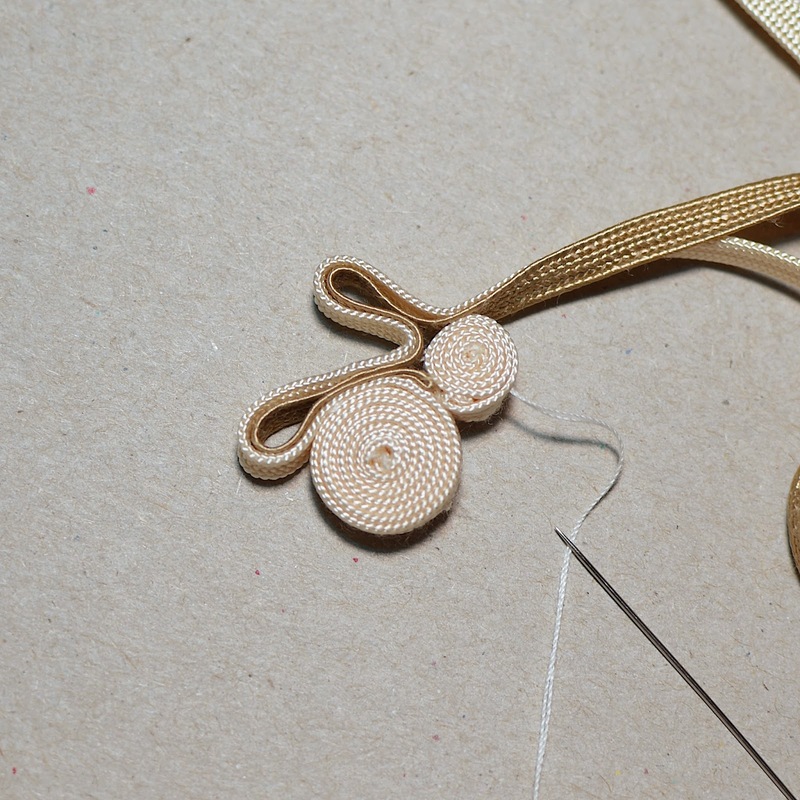 We often use only two to four pairs on a garment, and position them on the chest and neck, assigning snaps (press-studs) to the less accessible areas, like the side seam or armpit. 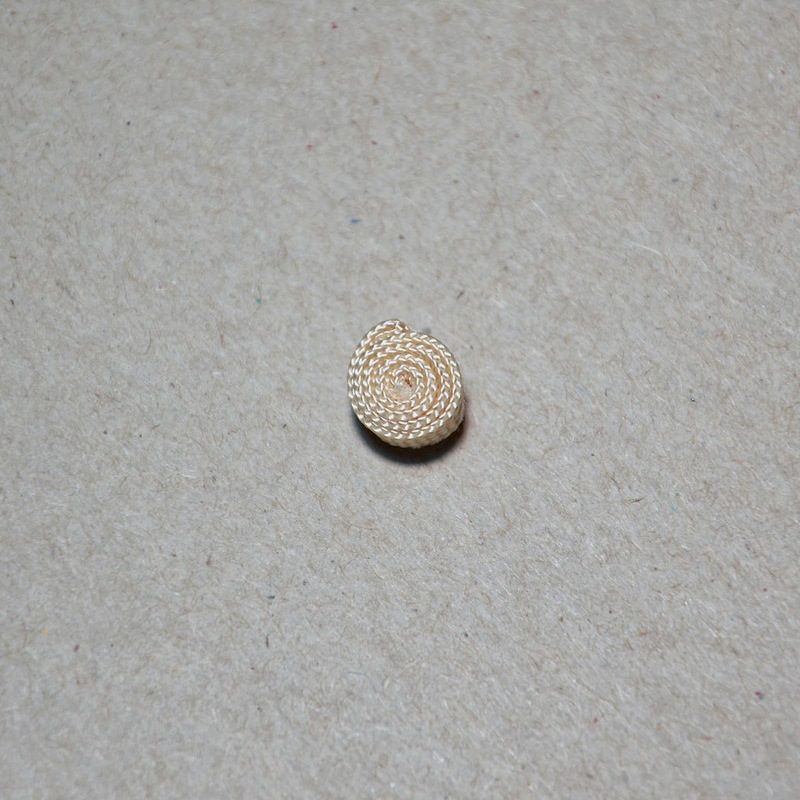 We also often supplement them with additional press-studs, for overall more secure closure. There is always a frog button at the neck. Correctly placed, the knot and loop themselves should lie along the seam joining the collar to the garment. This (the photo below) is wrong. I initially sewed my frogs higher on the collar than they should be because I didn't want to smoosh the frogs against my collarbone. Later, I decided I couldn't stand them being wrong and unpicked them. This (photo below) is better because the curve of the collar is no longer obscured and sits more naturally against the neck. So what if the frog loops get smooshed (actually, they didn't - although in the photo, I failed to align the collar properly on Fleur, so the right frog looks traumatized). Now you are frog experts. And can make your own qipaos. 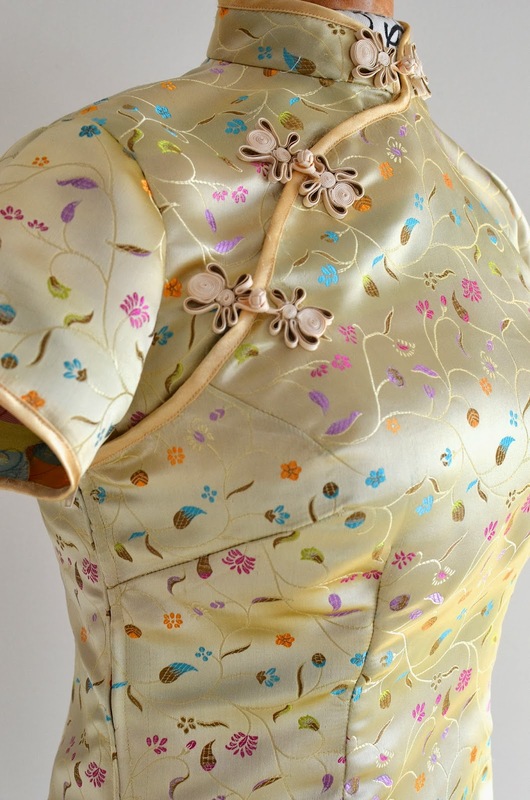 And also aodais (which are qipao-style tunics worn with flowy pants). And are no longer intimidated by fashion that's beyond your natural culture. And soon you will be sewing sarees! Kurtas! Kimonos! Hanboks! Kebayas! Baju kurongs! But here we must return to the familiar world of western fashion. I have a sleeve tutorial coming up, plus the deconstruction of The Frock. Overload of drafting posts, in other words. I blame the weather. They are all so pretty! I doubt I'll ever be making any, but I can still enjoy looking at them. :) Your parents are awesome! Just what I am waiting for!! Thank you, thank you. Hooray for mom!! Especially we share the SAME name!! No wonder I felt the kindred spirit when I first found your blog 6 months ago!! Now I am going to practice this and start making some for grandkids. Baby steps, baby steps. Oh thank you so much to you and your mom!!! Hermoso! Me encanta como queda, aunque me recuerdan más a arañas que a ranas :). Voy a tener en cuenta este tutorial. Gracias por compartir! Wonderful tutorial! A huge "Thank you!" to your Mom! And thank you for the video, too. Great tutorial! I think I'll stick to sarees. Not that I have a lot of call for those. But this is really cool -- thanks for sharing it with the world!! I feel completely honored. 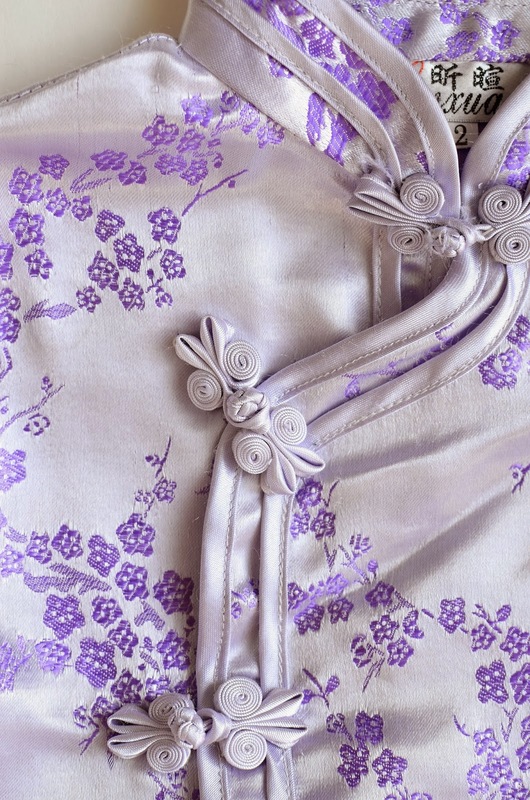 It is beautiful to see your mother's elegant hands making it look such an exquisite process. 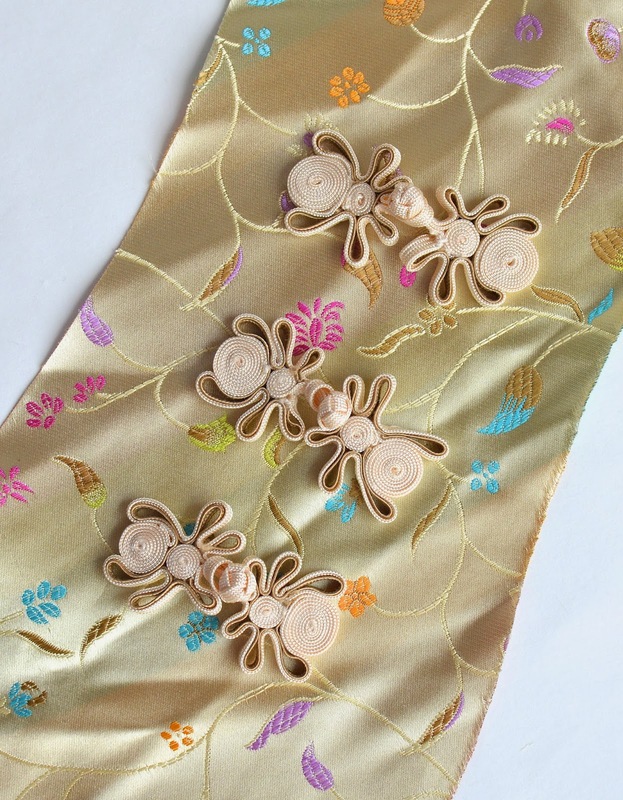 Even without the froggy part, these toggles could make such lovely fasteners down the back of a dress. Thank you for all the work you put into sequencing and drawing over the illustrations. I'm not trying to be a Debbie Downer! Cherish your momma and it's so wonderful for you to share with us! I would like to know what the proper name is for the cords you bought in singapore so I can get some too? I'm having quite a hard time looking for these online and locally since I don't know its name. Hei Yin: I. afraid I don't know, either. We used to casually call them "the straight satin ric-rac" and everyone in our immediate circle, including the shopkeepers, understood. However, we didn't do online shopping then, and I highly doubt if google registers that unofficial name. I am sorry! Thank you! This was exactly what I've been looking for. But how can I attach the button on the dress? 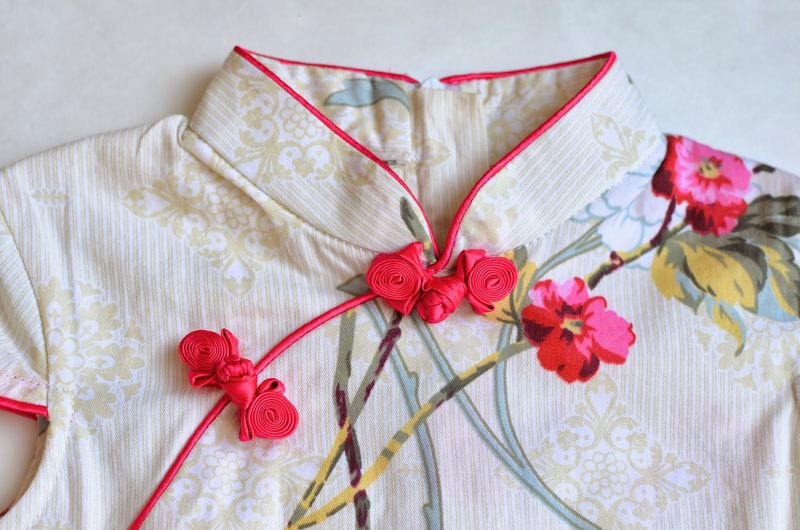 great blog post - I am keen to make my own for a cheongsam top I just started.